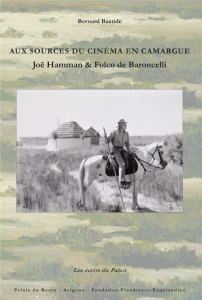 Through this book, Bernard Bastide (an expert on Louis Feuillade and Jacques de Baroncelli) brings to light the early cinema career of Joë Hamman, a filmmaker, artist, and actor, who conceived his acting in a fundamentally sober and athletic way. More precisely, the book describes how Hamman created what could be considered a kind of early French Western. Bastide reveals Hamman’s path through a wide range of fascinating sources: nine scripts and synopses by Joë Hamman developed between 1906 and 1913 are entirely transcribed; a summary table of the films shot in Camargue enriches our knowledge of this pioneer period; his continuous correspondence with the poet Folco de Baroncelli describes captivating practices and issues about early film shoots; finally, a wide variety of documents about Hamman are gathered and commented on by Bastide.